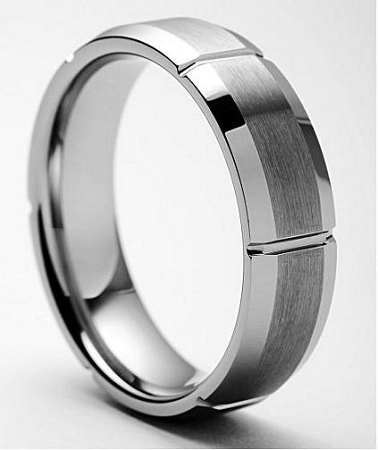 Tungsten Fashions is proud to offer this very unique tungsten ring design. Our Bellus 7mm design is brushed in the middle with polished beveled sides. This ring also comes in a matching 4mm band. Q: Hello, I am considering ordering the Bellus Beveled Tungsten Ring 7mm. I was just wondering about sizing. Do your ring come exact sizes or are they off just a bit? The one I currently have was almost 3/4 of a size off from another jeweler. Just want to make sure that would be spot on. A: Yes, our rings are all true to size. If you were sized at a local store, order that size and you will be all set. If you ever do need to make an exchange, there is no charge. I hope this helps! Thank you TF! A: Hi Rolando, Those are US Standard ring sizes. They are not in mm or inches. We have a helpful conversion chart online that can assist you. If you have a ring with you and need to find out the US Standard size, you can measure it to get the ring size. For instance, a ring that has a inside diameter of 19.8mm would be a size 10 ring. The 2.5 to 17 are US Standard ring sizes. I hope this helps! So different and already get so many compliments on it - love it, thank you. I have owned this ring for almost 3 years now. The ring shine like I purchased it yesterday. Very unique design and still get compliments for this ring. People get surprised that you can get it for $40! If your thinking about this ring, just stop and buy it! You'll love it! Plus you can't beat their customer service. Quick to respond, and fast shipping. Very nice quality and awesome customer service. This ring meets all my high standards. It isn't too flashy but still stylish and very masculine. I have already accedintly dropped it but not even a mark on it! Plus the beveled edge keeps it from 'catching' on things. And lastly, the comfort fit feels great (very smooth). Thank you for such a great product with such a GREAT price! Great ring with a different style - love the fast shipping! I am very pleased with this ring; much nicer than I had anticipated for the price...feels solid and like the comfort...if I ever get married again, I'm going with one of these! This ring was received within 2 days of ordering. Awesome quality at an un believable price. I just wish it came in an 8mm width. Will definitely recommend this site to friends and will purchase all my rings from here. Purchased this ring but had to return for a larger size. Love the ring and customer service was great. Will definitely shop the site again. I must admit this ring was well worth the money and I am very pleased with the quality of it. It is definitely of high quality and looks very nice. I have purchased other rings and have always been pleased and would suggest this ring to others. The service is outstanding as well. The quality of the ring is amazing for the price. However, I'm disappointed that the the color was much darker than the website photo. The beveling is much narrower than depicted. What a shame, but I won't ever wear it. We purchased this for my husband's wedding ring. It looks so nice on his hand. It's a great weight, is shiny and still looks masculine. We're very happy with this purchase! I have two great rings--the Marvo Black and the Bellus Beveled. These are two great rings. I like them because they look amazing with my bracelets and the weight of the rings is truly substantial. When purchasing both rings, the customer service was outstanding. I spoke to a male, and he was incredibly helpful in helping me make my choices. The ring is amazing. Sizing was perfect. Nothing else on the market looks this good for the price. Very nice quality, extremely happy with the purchase! Unbelievable for the price!